Daniel Cook is Master of the Choristers and Organist of Durham Cathedral and is recognised internationally as a liturgical and concert organist of the highest order. In addition he is Artistic Director of Mousai, Musical Director of Durham University Choral Society, and maintains a busy schedule of recitals, concerts and recordings, both as performer and producer, as well as being in demand as a conductor, teacher and singer. Daniel has twice been a finalist in the St Albans International Organ Competition. As a recitalist, he has played across the UK, Europe and Australia with performances in most of the cathedrals in Britain, the Royal Albert Hall, the Royal Festival Hall, and in the Grand Organ Festival at Westminster Cathedral. Increasingly in demand as an ensemble performer, recent engagements have included concerts with the Orchestra of the Age of Enlightenment in the City of London Festival, BBC National Orchestra of Wales in the St Davids Cathedral Festival, Onyx Brass in The Hythe Festival and The London Mozart Players in JAM on the Marsh. His work as an accompanist has taken him all over the world and he regularly works with many of the distinguished vocal ensembles and choral groups in the UK such as the BBC Singers, both as a conductor and organist. 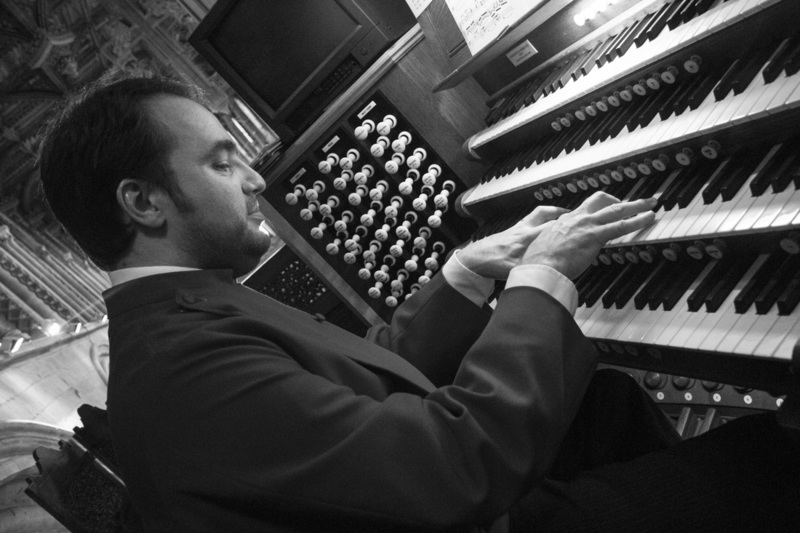 He has made several solo organ recordings for Priory Records and is one of their most recorded organists. Other projects have included a performance of the complete organ works of Olivier Messiaen in six recitals to celebrate the centenary of the composer’s birth, and CD recordings of the complete organ music of Charles Stanford, Herbert Brewer, Herbert Sumsion, George Dyson, Walter Alcock and William Harris. A solo DVD from Westminster Abbey will be released in 2018. In 2013 Daniel was elected an Associate of the Royal Academy of Music (ARAM), an award offered to past students of the Academy who have distinguished themselves in the music profession and made a significant contribution to it in their particular field.